Beginning February 8, please be prepared to access the Main Reception entrance via a temporary ramp. The ramp has been constructed near the large oak tree nearest Jones Plaza and Fannin Street (see photo above). Fencing will prohibit entry to certain construction areas for a time. Please follow signage and the direction of our Sunday morning greeters and safety staff. We appreciate your patience and flexibility! Bellows construction staff have made significant progress in gutting the Sanctuary basement. The demolition stage will be completed in early March. 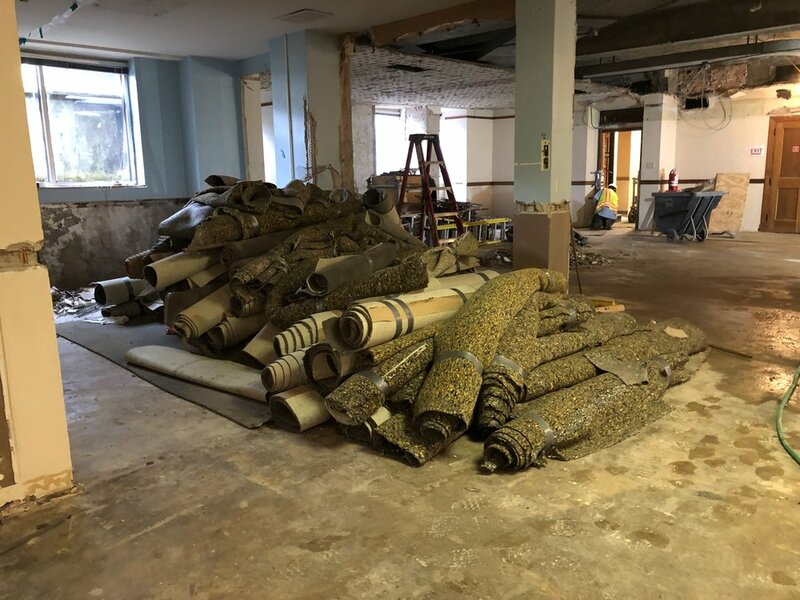 Please remember no entry to the basement will be permitted without Bellows construction supervisor and full safety gear on (with the exception of the Columbarium). You’ll see much of the Sanctuary Building’s facade has scaffolding in place on the Plaza and Fannin Street sides. This is in preparation for the extensive masonry cleaning and waterproofing, as well as window repair to be completed in phases. Some windows have already been removed and sent out for restoration. Replacement of the entire HVAC system has begun. Chiller units are on schedule. The hope is to complete this work by the end of spring.